as i mentioned previously, i joined forces with the lovely ladies above to feature one shirt worn four ways. we're all moms with busy lifestyles and we need to stay fashionable and functional at all times, well, with the occasional exception (4.5 inch heels are never functional but always worth it!). 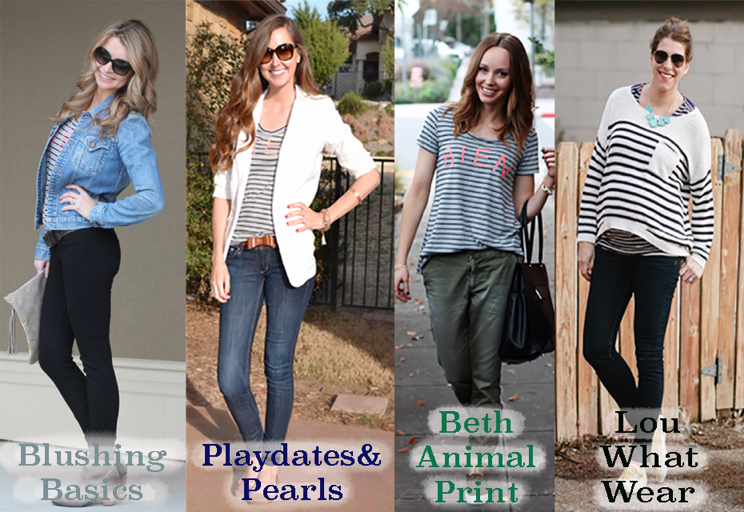 this week i joined forces with several other bloggers to feature the same shirt worn different ways. we are all mothers and face the dilemma of cute, casual and comfortable on a daily basis. i decided to pair the shirt with all of my go-to favorites: my denim jacket, my black skinny jeans and my grey booties. what made this shoot even more fun was that my little boo made an appearance as well. not one to be out-shined she stepped up in front of the lens like the natural model she is. Olive is sporting her latest FabKids outfit for February. one of my favorite clothing shops for kids you can go online and get an entire outfit for $15. a total steal. Ah! such an innovative way of collaborating! ♥ lovely styles!! Love your entire outfit - Those booties and oversized clutch are swoon worthy! I'm so glad I was introduced to your blog by Bethann.